Therm-a-Rest recently sent me a prototype of their hammock rain fly to review. It’s a basic rectangular tarp with excellent construction and attention to detail. 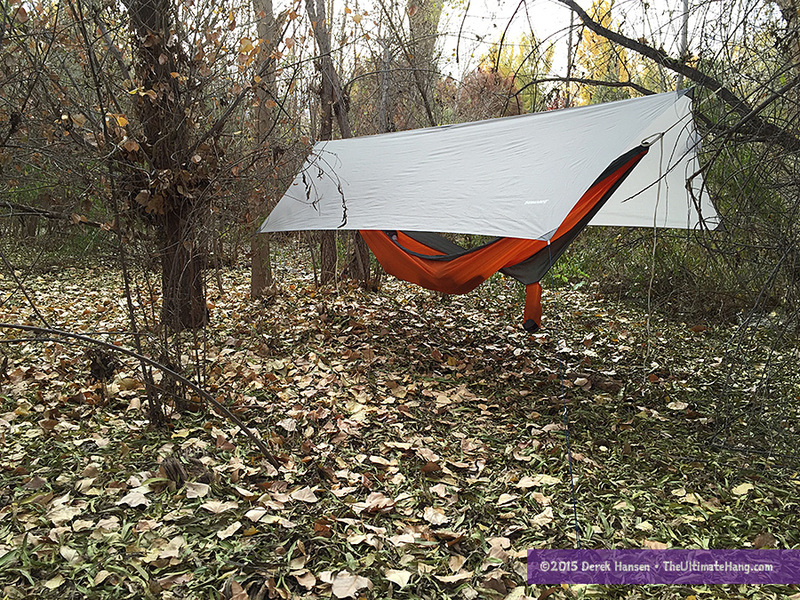 The Therm-a-Rest Slacker Hammock Rain Fly has a basic rectangular shape with short side panels. The muted shark grey color pairs nicely with the simple, unobtrusive design. The tarp has very slight catenary curves on the edges, and with an angled panel beak that rises to the ridgeline. There are four perimeter tie-outs and the two main ridgeline guy points. On the inside of the tarp, on the center of the ridgeline, is a clip point, useful for holding a bug net or a light. The ridgeline seam is tape sealed. The kit I was sent included nice aluminum stakes, guyline with a unique metal line adjusters, and a stuff sack. When it comes to hammocks and camping accessories I like simplicity, and the Therm-a-Rest Slacker Hammock Rain Fly certainly fits the bill. I would almost classify this tarp as minimalist, and certainly with the short side panels, this tarp doesn’t provide the most luxurious shelter space, but it does cover the basics. You can still pitch it in a porch mode, but there are certain limits to how tight you can pitch to get complete storm coverage. 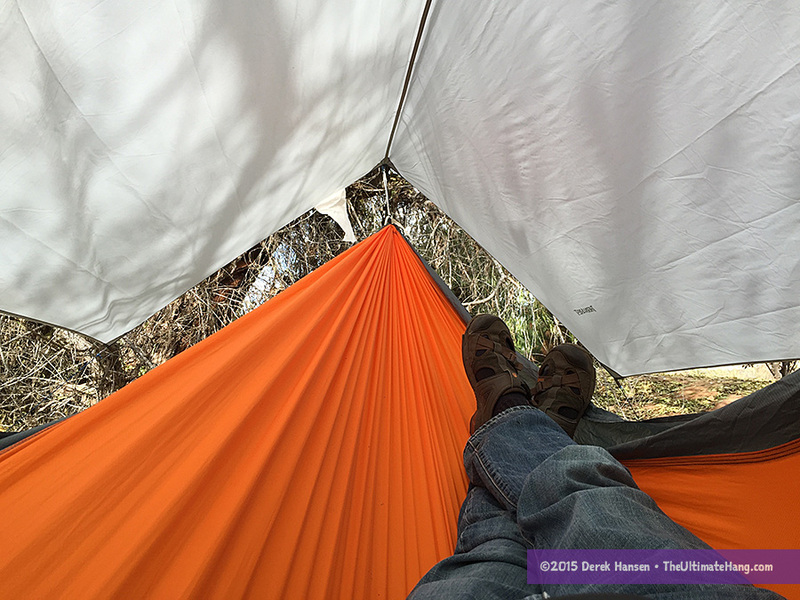 For storm coverage, I recommend getting some aftermarket pull tabs to connect to the asymmetric points, which would align with how you lay in the hammock, so you can pin down the ends of the tarp and still have breathable space under the tarp. This is one of my favorite ways to use rectangular tarps because you can still get good coverage but save some weight over larger tarps. For this type of material, I prefer to fold and roll when packing, but you can stuff it with some difficulty. What would make this tarp “perfect” for me would be to include mid-point tie-outs (for more pitching options), and maybe six more inches (15 cm) of length on each side panel for more coverage. If the material were a little lighter, it would be a great tarp for minimalist, gram-counting backpackers, but as it stands, there are other options out there that are lighter and have more options. Everything I’ve ever seen coming from Therm-a-Rest has been of the highest quality. Even though the design is simple, there is attention to every detail, from the pull tabs to the small guyline adjusters. The stitching is even and straight and tight. The material and all the accessories are high-quality—it’s just a good-looking, nice-feeling tarp. This is a good tarp for beginners who are happy doing three-season camping and aren’t as worried about harsh weather. You can take this tarp into worse conditions with some aftermarket adjustments like adding some side tie-outs or maybe even a door modification. For the first time I had a parent of one of our scouts ask me for a recommendation for a hammock that would be given as a Christmas present. 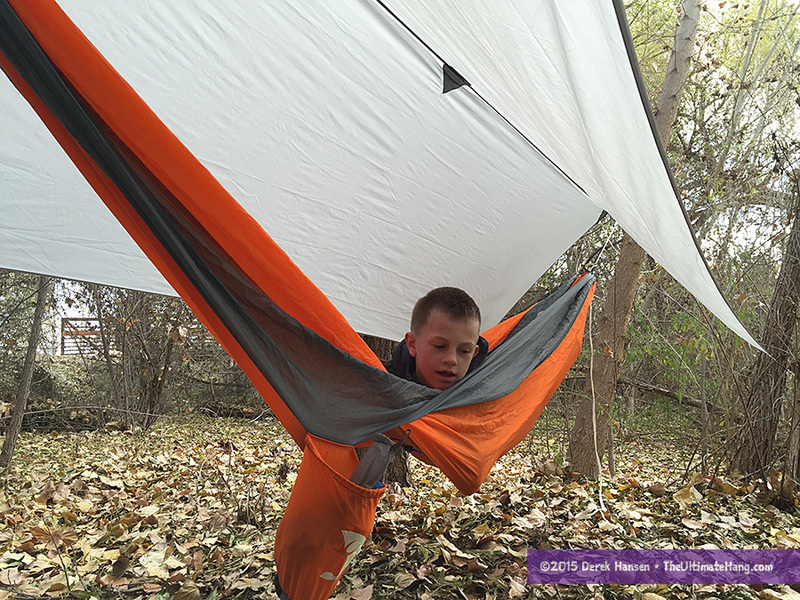 I have been bringing extra hammocks on campouts for a year now and allowing scouts to borrow them from me. I have been thinking that for a scout, a good beginners hammock would be a Grand Trunk Ultralight, for its weight and price, or an ENO singlenest that could be purchases on sale. But I do not have a great list of tarps to recommend. I do not want to tell people that they need to buy a $100 tarp, as the sticker shock would probably kill the deal for parents who are not sure these things would really be used. I know the thinking about buying cheap gear and replacing it often as opposed to buying expensive but durable gear for the long haul. The same thing applies to tent camping, and really all other classifications of gear. I would like to have some recommendations that would total about $100 for a beginner hammock camper, for hammock and tarp and suspensions. Do you have any ideas can you share them here, or perhaps do a full article about buying for a scouting aged camper, to get his feet wet? Yes, there are a lot of inexpensive options for getting a complete kit put together. When price is the primary driver, you may have to sacrifice in either quality or weight. For tarps, I usually recommend a utility tarp that has grommets around the perimeter. For our troop we found light versions with a camo pattern for around $5 to $7 each. Stores like Walmart or Amazon.com are places to look. A small jump up would be the Yukon Outfitters tarp. This is the one my son uses for scouts. It’s a simple diamond tarp but has plenty of coverage. The price is also reasonable at less than $40. One of the best and least expensive tarps I’ve seen is the Go! Outfitters tarp. You can get it for less than $70 and it is a big tarp with lots of options. Interested to see Derek’s response too. I have had good success with the Yukon Outfitters gear (freedom hammock and walkabout tarp) especially when they seem to be popping up on Woot.com on almost a weekly basis. If you catch these on a deal site you can be into a hammock and tarp for around $50 USD. One more budget friendly option I’ve used personally is the Tube Tent 1.0 from UST (Ultimate Survival Technologies) This can serve double duty as a tarp and emergency tube tent. There are plenty of tie out points along all edges. I replaced the heavy steel stakes with some lighter aluminum ones. I also switched the guylines for some 2mm reflective cord I had on hand. A quick web search shows this is available for about $35 USD at multiple retailers. I also am very interested to see Derek’s response to this. I would recommend for the price the Hennessy hammock scot version. For at $100 you can get the hammock, tarp, bug net and straps. All at 2 lbs 10 oz. Yes if you piece products together you can get a lighter weight package but you’re going to also pay way over $100. Hennessy also offered a 1 bls 12 oz weight package (Hyperlite Asym Zip) but you’re going to be in the $220 range. Hennessy is one of my favorite brands because of their complete kit. The Scout is too small for most adults so keep that in mind. Still, they do have other versions that are under the $200 price point. If price is your primary driver, you can piece together a kit for less than $100.